Continuous positive airway pressure, better known as CPAP, is a common type of therapy for obstructive sleep apnea (OSA). It’s also used to treat COPD and overlap syndrome, a term used when a person has OSA and COPD, concurrently. How Does the CPAP Machine Deliver Air and Oxygen? The CPAP machine comes equipped with either a mask that covers your nose and mouth or a mask that covers your nose, only. The mask is fastened to a long, plastic hose that’s attached to a machine. The machine has a motor that blows air into the hose. CPAP uses mild air pressure to keep the breathing passages open during sleep, a time when many people with OSA and/or COPD experience a drop in oxygen. CPAP can be used with or without supplemental oxygen. 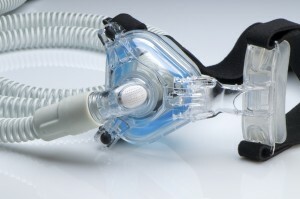 CPAP is usually the best treatment for OSA, a condition that results in episodes of shallow breathing and/or “apnea” (cessation of breathing) during sleep.1 In addition, people with stable COPD who have normal oxygen levels during the day but whose oxygen saturation drops during sleep may also benefit from CPAP. Finally, in severe COPD, CPAP can be thought of as the middle man between standard oxygen therapy and an artificial breathing machine, often delaying the need for intubation and mechanical ventilation. Symptoms of OSA and overlap syndrome include loud snoring, interrupted sleep patterns and excessive daytime sleepiness. Many people who use CPAP regularly feel better after they begin treatment, reporting an increase in mental alertness and improved job performance during the day and better sleep with less snoring at night. Not only does a CPAP machine often delay the need for intubation and mechanical ventilation, it can also help people with overlap syndrome live longer. According to a study published in the Journal of Clinical Sleep Medicine, people with OSA and COPD who used CPAP more than two hours a night lived longer than those who used CPAP less. Researchers also found that CPAP was especially beneficial in COPD patients already using long-term oxygen therapy (LTOT). COPD can lead to other medical conditions as well, including chronic hypercapnia, a condition that occurs when elevated levels of carbon dioxide (CO2) are found in the blood. Left untreated, hypercapnia can be fatal. According to a report issued in American Family Physician, CPAP can help COPD patients with hypercapnia when correcting the underlying cause does not solve the problem. For more information about CPAP for OSA, COPD and overlap syndrome, talk to your health care provider. National Heart, Lung and Blood Institute. “What is CPAP?” December 13, 2011. Stanchina, M. L., et. al. “Impact of CPAP use and age on mortality in patients with combined COPD and obstructive sleep apnea: The overlap syndrome.” Journal of Clinical Sleep Medicine, 9(8). Hunter MH, King DE. “COPD: management of acute exacerbations and chronic stable disease”. Am Fam Physician. 2001 Aug 15;64(4):603-12. I thought it was interesting to learn just how beneficial using CPAP equipment can be if you suffer from sleep apnea. The article mentions that increased mental alertness and an overall greater sense of well-being are associated with utilizing a CPAP. My wife suffers from sleep apnea, so how would we go about getting a CPAP machine for her to use? If you suspect your wife might benefit from a CPAP, we would suggest speaking with her Pulmonologist. A proper sleep study would help identify a need for a CPAP or bilevel device. Does the Inogen machine have any role in sleep apnea treatment ? Hi John, Our portable oxygen concentrators (the Inogen One G2, G3, and G4) are not compatible with CPAP machines which are used for treating sleep apnea. However, the Inogen At Home Stationary Oxygen Concentrator is compatible. To answer your question, no we do not sell any CPAP or sleep apnea devices but some of our oxygen concentrators are compatible with most CPAP machines. For more information, please call an Oxygen Specialist at 1-800-374-9038.